A Hamilton police officer is facing multiple Police Services Act charges in connection with an incident where he arrested two photojournalists at the scene of a fatal accident in 2017. Const. Jeff Todoruck is alleged to have committed five acts of misconduct, including two counts of discreditable conduct, two counts of neglect of duty, and unlawful or unnecessary exercise of authority. He made his first appearance Wednesday at a Police Act hearing at Hamilton police headquarters wearing a green shirt and tie. 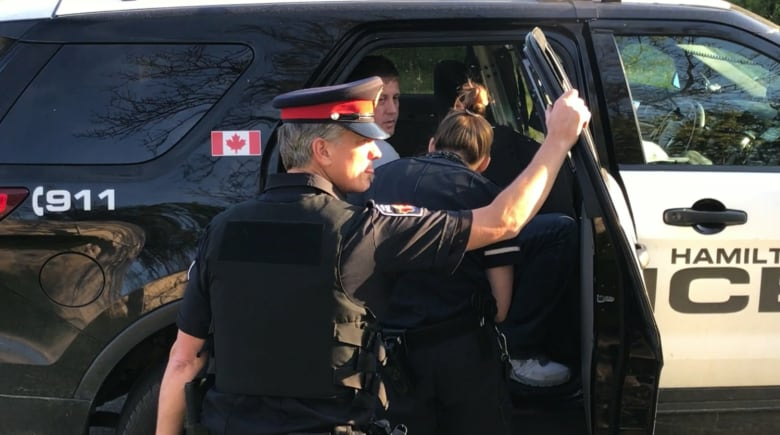 The charges come after a tense incident in May 2017, when Todoruck arrested Global News TV camera operator Jeremy Cohn and independent freelancer Dave Ritchie at the scene of a fatal Waterdown crash where a young girl had died. Although two journalists were arrested that day, the police act charges only relate to Cohn’s arrest. A video from the scene shows Todoruck pinning Cohn to the ground and cuffing him with zip ties, then pulling him to a police vehicle. The hearing is the result of a public complaint to the Office of the Independent Police Review Director brought by Global News. News director Mackay Taggart said while the arrest of the Global journalist in Hamilton was one specific incident, it seems to be part of a larger pattern that’s at play. “We’re seeing patterns … of journalists being prevent from going about their work, and that’s concerning,” he said. K.C. Wysynski, the lawyer representing Todoruck, said she intends to “vigorously” defend the allegations made against her client. Wednesday’s appearance lasted just over 10 minutes, as hearing officer Greg Walton put the matter over for six weeks to give the lawyers involved time to produce documents, vet them for personal information and give Todoruck a chance to review them. A conference call to set the next hearing date is scheduled for May 6 at 9 a.m. ET. Taggert declined to go into detail about how the arrest impacted Cohn, saying he’s hopeful the photojournalist will be able to express that himself as the hearing goes on. But the news director did speak to the role journalists play in informing communities. “We believe we have the right to report the facts and the circumstances surrounding the incident without any interference with any third party, while respecting the law, which we believe our journalist was doing that day,” he said. Ritchie reportedly said that when he arrived at the scene, Todoruck called the media “scumbags,” leading to an argument that ended with the freelancer being tackled and arrested. The journalist was originally charged with resisting arrest and obstructing a peace officer. Those charges were dropped after he reached an agreement with the Crown to do 10 hours of community services and donate $250. Cohn was released without charges and is suing Hamilton police for nearly $1 million. The girl had already been taken to hospital when he arrived at the scene, and there was no police tape, according to his lawsuit. When officers did put up police tape, Cohn stayed behind it “at all material times,” the claim adds.